I recommend a doctor to friends who've just moved to Paris, and they later report that the entire way up the rickety, dank staircase, they were really questioning my wisdom, or possibly my sanity. Most doctor's offices here are simply converted apartments in old buildings which seem places more likely to give you mysterious illnesses than cure them. My friends are just lucky I don't send them to the first doctor we tried when moving to France: His waiting room looked like your great-grandma's parlor, if she were a mild hoarder, and the actual office was not any more sterile, modern, or clean. I can't say this is the only reason we switched doctors (the fact that he spoke English did not compensate for the fact that he didn't seem particularly competent). Our new family doctor's office is up some dark, ancient, rickety stairs, though once you're at the top, it's a fine, clean waiting room and a very modern, clean, office. The doctor himself is extremely competent, warm, and we like him very much. The same holds true for dentists and nearly every other doctor we visit here (it doesn't matter: dermatologist, gynecologist, podiatrist, ophthalmologist, etc.). And then there's this hospital, rather on the other end of the spectrum. Hidden in plain sight just in front of Notre Dame, the Hôtel-Dieu ("Mansion of God" if you want to be somewhat literal) is an ancient spot, the oldest hospital in Paris, in fact, first founded in the year 651 A.D. At that time, it was closer to the river bank, and it has existed on or near this spot since then in various permutations, all of which burned down and were rebuilt. The current incarnation was built in 1877. Though millions of tourists walk right by it, you are in fact allowed in to see it, and for free. Amazingly, it is still a working hospital -- but not for much longer. It's slated to close in a couple years, at which point there will be no more major hospitals in central Paris. This doesn't go over too well with the locals, and there's a permanent protest going on outside the building. If this were San Francisco, I would say they were closing the hospital in order to create high end housing; if you were to convert the existing building, with these gorgeous courtyards in this spot right by Notre Dame, to housing, it would have to be worth hundreds and hundreds of millions of euros. I mean that literally. Possibly half a billion? But since this is France, I suspect it will be used as some sort of government administration building. That would be fine with me since I might still be allowed to walk in and enjoy the courtyards. Speaking of "ye olde doctor", if you're ever in a medical jam here in Paris -- even in the middle of the night -- know that doctors still make house calls. Not all doctors, and not our doctor as far as I know. If yours doesn't, or if you're just passing through, you can call the service SOS Medicins (01 47 07 77 77) and, for really very little money (around 40-90€, depending on day, time, service needed), have a doctor come to you. Tomme d'Alpage is a cheese so ancient, it barely has an actual name. It means, simply, a big cheese wheel from the Alps or the mountain tops. Like all of these big mountain cheeses, it's a cows' milk, hard cheese with a sweet, nuttiness to it. Because it's not a cheese with a famous name (or even one that's highly specific or recognizable), it tends to be a cheese made, sold, and eaten locally. Traditionally that means on the farm itself, though we find ours at a lovely, high-end cheese shop in Strasbourg, Alsace, near the mountainous region where such cheeses are made. Our Tomme d'Alpage, which could very well look and taste quite different from your Tomme d'Alpage, is delicious -- filled with tons of little air holes and with a texture that is that magical halfway point between crumbly and creamy. The flavor is both salty and sweet, with complex hints of grasses and flowers. The outside, rough and brown and bumpy, is too tough to eat. Not only is the store I buy the cheese in all brick and old-looking, like the doctor's offices of Paris, but the cheese itself is kind of dark, rough, and grungy, like the entries to those old offices. In fact, it turns out to be quite good -- just like my current family doctor -- and well worth the money. 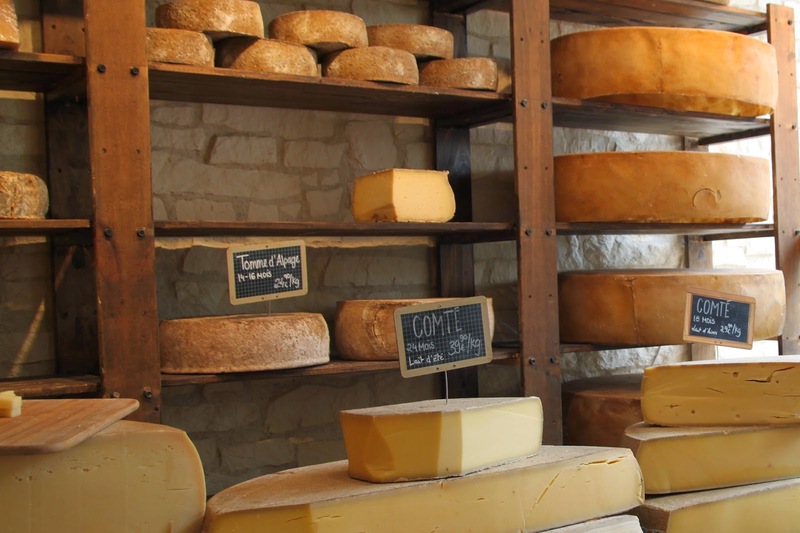 Tomme d'Alpage is an ancient cheese, one that's been around even longer than the Hôtel-Dieu.